Tobacco is an annual or bi-annual growing 1-3 meters tall with large sticky leaves that contain nicotine. 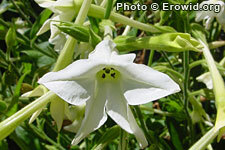 Native to the Americas, tobacco has a long history of use as a shamanic inebriant and stimulant. It is extremely popular and well-known for its addictive potential. Is there nicotine in tobacco products other than cigarettes?